Ford has added more models to its Transit van range with the introduction of a new 14-seat Transit Minibus along with an updated tipper, while all rear-wheel drive Transit vans from 100bhp to 200bhp will now come with a six-speed gearbox as standard. 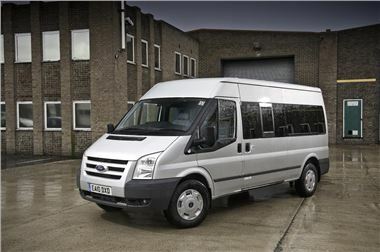 At 3.5 tonnes GVM, the new Minibus version can be driven on a category B car licence (on a non hire and reward basis). This increases the number of minibuses for non category D licence holders to three; a nine-seat shuttle, a 12-seat minibus and a 14-seat minibus. The 17-seat Transit Minibus has a 150kg increase in payload taking it from 4.1 tonnes to 4.25 tonnes. All models are designed to carry occupants in a safe, spacious and well-equipped interior. The Transit provides a car-like ride and handling experience which aids those who usually drive cars. Standard safety features on a Ford minibus include ABS, ESP, driver and passenger airbag with the latest generation seatbelts that suit both adults and children on 15 and 17-seat models. The new six-speed gearbox, now on most Transit models, has a wider spread of gear ratios which means easier initial pull away in first gear and with reduced stress on the clutch, its life is usefully extended. The new six-speed transmission will also deliver improved mpg and lower CO2 figures. Meanwhile, DAB radio has been fitted to the Transit SportVan, making it the first medium commercial vehicle to come with DAB radio as standard. DAB radio is also a £200 option on all "Limited" series. 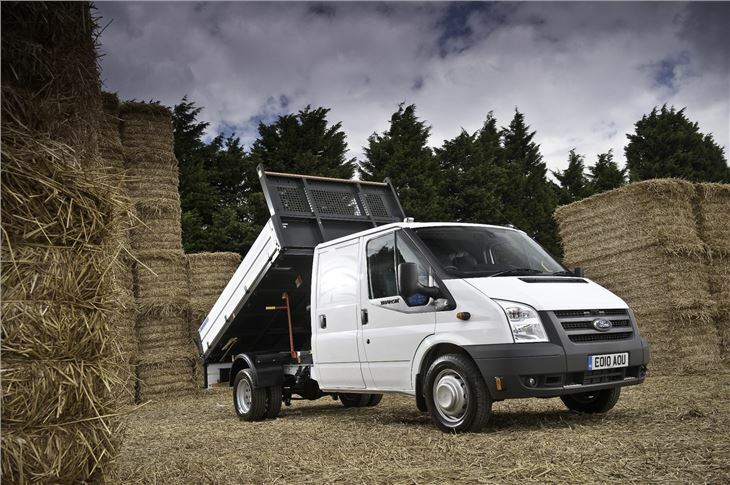 Ford is also launching the new One Stop Shop Transit Tipper - the latest version of the UK's best-selling tipper. Following feedback from customers, there are 35 changes to the Tipper, designed to increase productivity, improve safety and lower the cost of ownership. The latest model has an improved payload, a lower loading height as well as more intuitive tipper control gear. The Transit Tipper still remains the only Tipper in the industry to be approved by the TÜV Rheinland Group - a global leader in independent testing and assessment services. The body weight for the single and double cab models has been reduced by 51Kg & 40Kg respectively, increasing the payload. The loading height has been reduced by a useful 40mm by lowering the subframe by 30mm and the deck under-structure by 10mm. The loading height is now under one metre (995mm) at the rear axle to assist manual handling of loads. The deck retains its 2.5mm steel floor and its high strength roll formed edge to the rear. The control gear has been redesigned to provide a simplified, more intuitive joystick operation. The tipper controls are now all in one position to the offside and adjacent to the driver's seat. This gives full access to the controls either when seated or from outside with the door open. On the outside, the previous tungsten filament end outline marker lamps mounted on brackets extending from the rear light bar have been replaced with LED lamps mounted on the rear crossmember of the load bed protected by the roll-form edge of the rear load floor edge.